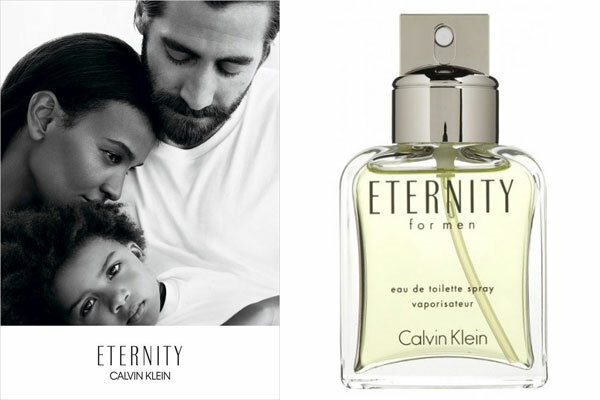 Jake Gyllenhaal for Eternity Calvin Klein fragrance, a classic fougere scent for men with the signature wet crisp herbs blended with warm amber and sensual wood notes. Created in 1989 by perfumer Carlos Benaim, this classic masculine cologne has been the reinterpretted yearly for summer editions and the line has expanded to include a multitude of flacons. The fragrance is available in eau de toilette spray and matching body products at department stores. The new October 2017 fragrance campaign features Gyllenhaal, actress Leila, and model Liya Kebede photographed by Willy Vanderperre and directed by Cary Fukunaga.